The pizza is a passion of mine; but also the cake, the turnovers and also any kind of bread. And always, as soon as possible, all prepared at home! Although I often prepare bread at home, it is always about a kilogram of weight. 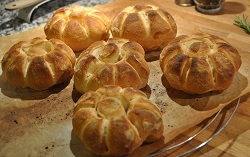 For some time I had decided to prepare also the mythical Milanese michette, those blown, because I do not find them here! Those michette that many years ago, early in the morning were delivered still warm and crisp front door of the house from the baker's boy. Those michette today, also in Milan, are no longer so easily. from pastry doughs to seals, tools for cooking. Mediterranean calzoncelli, appetizer or a main dish? soft bread with red onions: yum! My calzoncelli for dinner tonight! The focaccia: Today anchovies and tomato! The michetta: how to make the calendering at home? The pizza in the oven! Pizza in the oven, almost like in a pizzeria! The pizza, I like it! Pizzas, cakes, breads and everything else: a new section!